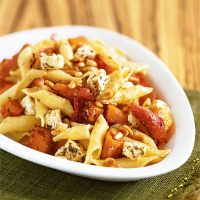 Sweet maple cure bacon, roasted squash and feta cheese team up to make a robust pasta dish that is ready in 30 minutes. Preheat the oven to 200°C, gas mark 6. Cut the squash in half, scoop out and discard the seeds. Using a small, sharp knife, peel the squash, then cut the flesh into bite-sized chunks and place in a roasting tin. Drizzle with the oil, stir in the garlic and oregano and season with freshly ground black pepper. Roast for 20-25 minutes, stirring occasionally, until the squash is golden and tender when pierced with the tip of a sharp knife. Preheat the grill to high and cook the bacon for 4-5 minutes until crisp, then cut into bite-sized pieces. Meanwhile, cook the pasta in a large pan of boiling water according to pack instructions, drain well and keep warm in the pan with the lid on. Add the bacon and feta to the squash and return to the oven for 2 minutes, until the cheese starts to soften and melt. Remove from the oven and stir in the drained pasta. Serve immediately, seasoned with freshly ground black pepper and a scattering of toasted pine nuts, with a salad of watercress. Garganelli pasta is a grooved, tubular pasta suitable for use with many different sauces. The grooved texture helps the feta cheese to cling on as it melts.